With the lengthening days and the greater power in the sun, temperatures rise. Energy Flows, buds break, flowers and new shoots appear. In these latitudes and more so North of here, people suffer from Seasonal Affective Disorder [SAD}. This is probably the most well known effects of the lower light levels and shorter day lengths that accompany the Autumn and Winter seasons. The Mayo Clinic uses light therapy to treat SAD and certain other conditions including Depression, that does not occur seasonally, Sleep disorders and Dementia. The treatment is conducted using a light therapy box and is also known as bright light therapy or phototherapy. Light therapy is thought to affect brain chemicals linked to mood and sleep. Through a detailed study of chromotherapy, with patients exposed to sunlight through color filters, theories were developed to prove the relationship between melatonin, light and color. The studies investigated the hormonal changes that result from exposure to sunlight. Sunlight is of course a perfect blend of seven colors; different colors are responsible for the release of different kinds of hormones, which keeps us healthy. Light therapy or chromotherapy is a centuries old concept, with the Egyptians and Greeks using light and color. In ancient Greece, color was used to restore balance using both direct exposure to sunlight and indirect methods where garments, oils, plasters, ointments and salves were used to treat disease. Avicenna (AD 980) advanced the idea that color is an observable symptom of disease. Today we see a yellowing of the skin, jaundice, as being an indication of liver disease. Numerous books and scientific papers have been published on the application of colored light therapy, some look at the use for light and the biochemical reactions, other studies looked at psychophysiological influences, others looked at more everyday instances. For example, chromotherapy has been used to improve the performance of athletes; red light appears to help athletes who need short, quick bursts of energy while blue light appears to assist in performances requiring a steadier energy output – the sprinter versus the marathoner. It is also suggested that pink light has a tranquilizing and calming effect within minutes of exposure. It suppresses hostile, aggressive and anxious behavior. In contrast, yellow should be avoided in such contexts because it is highly stimulating. There is a large body of work supporting the use and benefits of light and color therapy. These include the use of single colors and also combinations of two or more colors for therapy. As you know Merritt is a Certified Colorpuncturist using crystals and colored light and Simon uses colored lights with the Crystal Light Table. Sessions can be tailored to use a specific color palate to address specific issues. 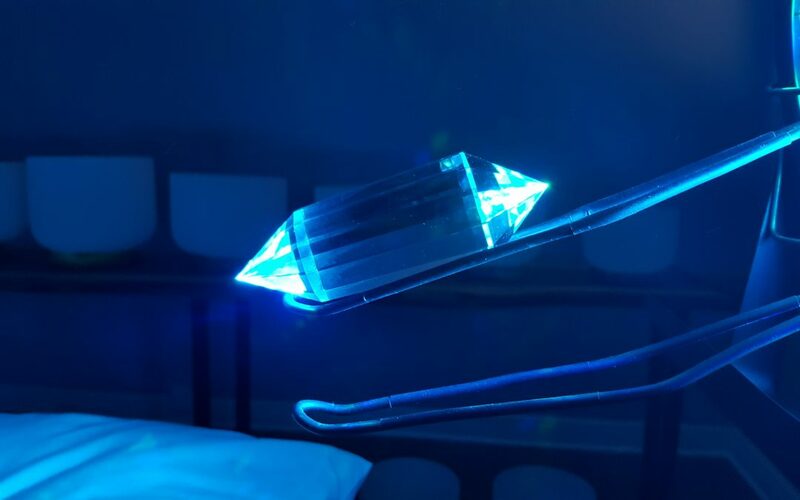 The latest piece of information that supports the use of colored light, has just been published and shows that blue light can be used to weaken Superbugs such as MSRA so that it can be treated with a simple antiseptic.